Effective fluid therapy is a mainstay of managing the critically ill patient. Vigorous fluid replacement improves venous return, cardiac output and tissue perfusion. During (hypovolemic-related) low output syndrome (LOS) the body tries to compensate perfusion deficits by redistribution of flow to vital organs (e.g. heart and brain) resulting in an underperfusion of splanchnic bed, kidney, muscles, and skin. Various inflammatory mediators and circulating vasoactive substances are of particular importance for deteriorated perfusion in this situation. Activation of the sympathetic nervous system is one of the compensatory mechanisms to maintain peripheral perfusion. Although this compensatory neurohumoral activation is beneficial at first, this mechanism becomes deleterious and may be involved in the poor outcome of the critically ill. Thus volume therapy should not also tend to optimize macrocirculation and oxygen delivery but also to improve microcirculation. 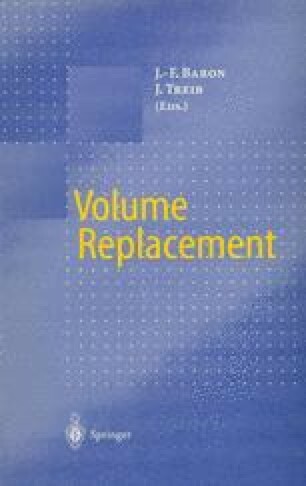 There have been several approaches to defining the optimal type of volume replacement in the critically ill (Table 5.1).